White/Clean/Sensitive/Polish/Massage 5 Modes optional and real time adjustable. 3 replaceable toothbrush heads included. Tooth-waved bristles made with Dupont nylon, to suit teeth topography for thorough cleaning of gums and hard to reach areas. Rounded bristle top for safety and gentleness. USB charging, safe and easy, auto shut off after charging is completed, to avoid overcharging for longer battery life, convenient to use at home or travel. 2 minutes smart timer with interval pause reminding each 30 seconds. Waterproof can be use in a shower. Low battery reminding. Anti-slip handle. Protective bristle cover. LONG BATTERY LIFE supported by USB charging, safe and easy, auto shut off after full charge, compatible with any power source. 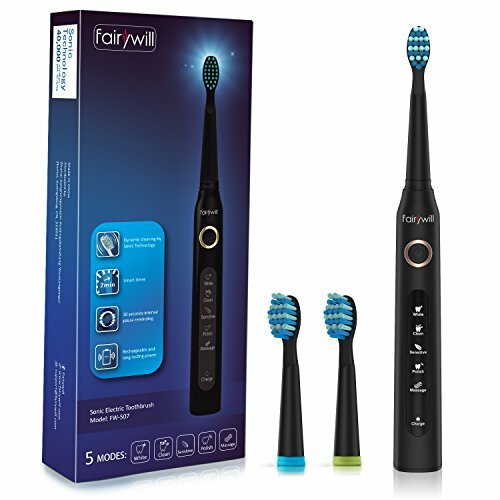 Electric toothbrush convenient to use at home or travel. Low battery reminding. If you have any questions about this product by Fairywill, contact us by completing and submitting the form below. If you are looking for a specif part number, please include it with your message.